One can now subscribe to the online retailer’s Prime membership services on a monthly basis by paying Rs 129. Amazon has introduced a new monthly payment plan for those who want to subscribe to its Prime membership. The service is now available with a monthly plan of Rs 129, alongside the standard Rs 999 yearly subscription. However, it should be noted that when one subscribes to the yearly plan, they end up paying approx Rs 83 per month and so the new plan is slightly expensive in comparison, but it is a good option for those who don’t want to commit to an year worth of subscription to the service at once. 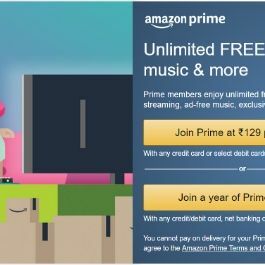 Amazon Prime subscribers get to avail benefits like unrestricted access to Prime Videos, which has a catalogue of movies and TV shows, along with free one and two-day deliveries on Amazon-fulfilled products to the serviceable pin-codes in India. To recall, the yearly subscription of the service was offered at Rs 499 last year as a launch offer, but it was soon bumped up to Rs 999. Other video streaming services like Netflix offers a free one-month trial to new-users so that they can decide whether or not they like the service before subscribing. However, as there is no such free one-month for Amazon Prime videos and the new Rs 129 plan is currently the best option for those who want to give Amazon’s Prime services a try. However, if one is a Vodafone RED or Airtel Infinity postpaid subscriber, they can get free access to Amazon Prime. Both the telecom operators offer free access to the service, albeit under some terms and conditions. Airtel users who are subscribed to the company’s Infinity plans priced at Rs 499 or above will get one year of Amazon Prime membership for free, while Vodafone RED plans starting at Rs 399 offer the same benefit, along with some other offers. You can read more about Airtel’s offer here and Vodafone’s offer here.